Blog Quick Quotes: Double Inspiration: Donna and Christine! Double Inspiration: Donna and Christine! We have a special treat for you today on the blog. Our Guest Designer for the month, Christine Slak is here to share her final project with us and Donna has some tips to share. Enjoy! Hello Crafters! 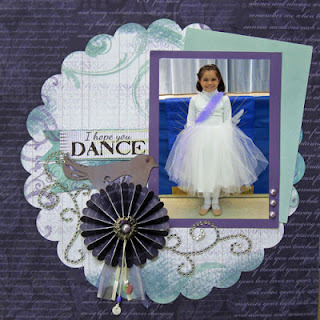 Christine here again to Guest Design with Quick Quotes. Never in a million years would I have imagined that I would work with a Pink Flamingo in a swimsuit but it did happen. Not only is the Flamingo wearing a swimsuit, he also has on sunglasses and is riding a surfboard! My craft style tends to lean more toward the vintage, floral, distressed look. For my final Guest Designer Blog post for Quick Quotes this month, I decided to step outside my comfort zone and do something completely different. I went to a local Thrift Store and looked for something "unusual" to inspire me and found this little treasure. I have to admit, it didn't immediately inspire me but thought it was so bizarre that if nothing else, it would make a great gag gift for our annual Christmas gift exchange and I would only be out $2. I was a bit embarrassed by the piece and I actually hid it under other items in my cart. So what did I finally come up with? A little summer mini album featuring the Quick Quotes Be Bold paper line. It's going to be the perfect Hostess Gift when I go to stay with friends at their ocean front beach home over the 4th of July. It's a petite 4" x 6" album so I was able to utilize almost all of the papers in the Be Bold 6 x 6 paper pad. For the cover, I trimmed out a phrase from one of the cut outs pages, layered it contrasting papers and then used pop dots to give it some dimension. I fussy cut out the wave/swirl shapes from another of the papers and then added Stickles to give the cover some sparkle. A metal dragonfly added a touch of whimsy. For the interior pages, I used more of the cut out phrases and journaling cards from the 6 x 6 pad as well as some of the Be Bold die cut stickers. I added several photo mats so there will be plenty of room to add pictures. I also inked the edges of all the papers with a variety of the Powder Puff Chalking Inks. The book was bound using a Zutter Bind-it-All and a variety of coordinating ribbons were tied to the wire binding coil. Right about now I'm sure you're beginning to wonder what did the Pink Flamingo have to do with any of this design? Wonder no more as you gaze upon my finished project! The surfing Flamingo became the perfect stand to hold my mini album! It should make a great conversation piece and the couple who I am gifting the piece to have a sense of humor that will truly appreciate it's quirkiness. Powder Puff Chalking Inks in Lemonade, Red Hot, Blue Moon, Green with Envy, Coconut. It has been a pleasure this past month to be able to share some of my creations with you and again I would like to thank Quick Quotes for asking me to be a Guest Designer for the Month of June. Hi everyone, Donna here to give you two tips today. The first tip is, if your like me, I get a ton of greeting cards, and it seems more and more they have embellishments on. I guess my family knows how much I love scrapbooking, so it seems to me they deliberately give me a card with some kind of embellishment on that I can repurpose to my layouts. 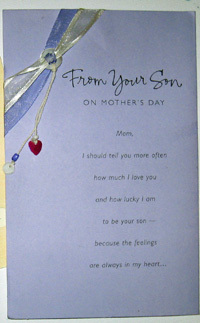 Here are an example of a card I received recently. Instead of just tossing the card out, I took off the embellishment and ribbon and repurposed it on my layout below. Another tip I have is to s-t-r-e-t-c-h your bling. 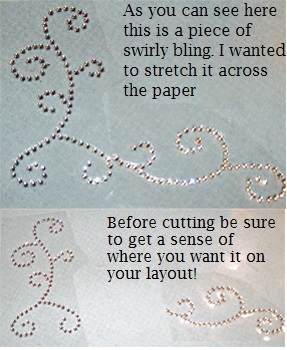 What I mean by that is if you want your bling to reach further across the paper just cut it and place a larger embellishment in the middle. That way your crystals don't get hidden under a flower or other embellishment and you get more bang for your bling! The ribbons I cut in half and put it down from my rosette and the hanging part with the sequin, I attached it to the rosette added another embellishment to cover the plastic ring and topped it off with bling from Want2Scrap. I hope you enjoyed today's creation. Christine- what a fun mini! I love getting inspiration from thrift shops. Thanks for sharing your talents this month. Donna- very pretty LO. Thanks for all the tips, would love to hear more. Christine, it's be a pleasure having you as a guest designer, I love your mini album and all your creations. Christine, I have so enjoyed seeing your creations this month. Your mini is fabulous and your inspiration is hilarious. Thanks for the tip Donna. I love your layout. Your album is so cute and the flamingo is hilarious. What a totally awesome project, Christine! I love how you turned the mini album Christine! That is so clever!! And Donna, your layout is so sweet! Love the photo!